Encourage the students to start working in the same group. This way there is less fluctuation and the group can really turn into a team. In the optimal case, students will even meet outside of the recitation to discuss physics or – more realistically – will prepare together for the final exam. This is often beneficial for all of them. Assign short codes to the different groups and ask the students to put the short code of their group on every recitation assignment. For instance, if you are teaching a section 008 of some course in which you have 9 groups, you could use short codes G8-1, G8-2 up to G8-9. Having these short codes allows you to put the grades directly at the right place without having to search for the name of the students in the full list of students. You can then use Excel functions to copy the grades of group to all members of the group. IMPORTANT: You will still need to check that everybody of the group was present and otherwise put manually a zero into the fields for students that didn’t attend the session. However, in general this should already save you lots of time. I prepared the following example Excel sheet. In the upper part of the excel sheet, we have list of all students of the section starting from the second row. The first column contains numbers from ID expressions onwards which are only important for the macro I wrote. In the lower part, we have a list of groups and the initials of the students in the group (in general one could also write out the names). Using excel functions the students are assigned to their group. The 4th column contains the grades for the students in the first recitation. 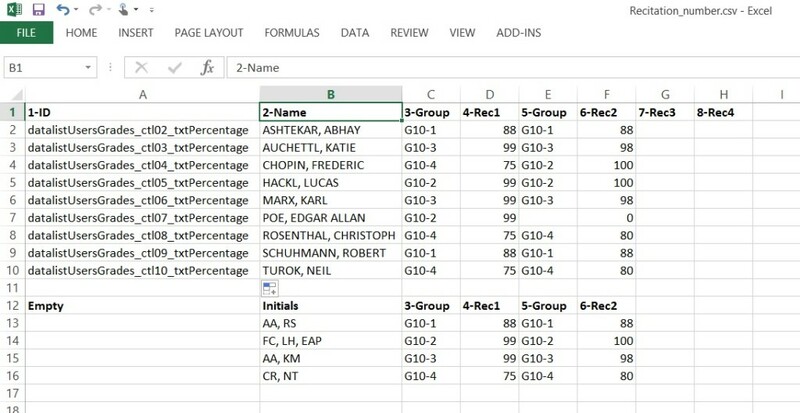 They are automatically assigned via the excel function based on the group. The 5th column was introduced to show the change of group: FREDERIC CHOPIN swapped from group G10-4 into G10-2. Based on the excel function he got accordingly the grade from group G10-2 for his second assignment. The initials in the lower part of the second column allow to quickly see who and how many are in the different groups. When putting in the group grades for the assignments, one can quickly compare the initials with the student names appearing on the sheet. If a student is missing, one can immediately look up the student name in the list (among the few members of the group) and put zero in. In our example, this is done for EDGAR ALLAN POE for the second recitation. The first number in the title of each column is just the number of the column (counted from 1). This is only useful if you use my macro because there you need to know the row number of the column you want to copy to Angel. I’m confident that these explanations give enough inspiration for an efficient grading work flow. You might also be interested in my macro that is explained in how to automatically copy grades from Excel into Angel.